Your Sinclair or YS as it was commonly abbreviated, was a British computer magazine for the Sinclair range of computers, mainly the ZX Spectrum. The magazine was launched in December 1983 as Your Spectrum by Sportscene Specialist Press, later known as Dennis Publishing. Initially, it was published bimonthly, changing to monthly in June 1984. With the January 1986 issue, the title was relaunched as Your Sinclair, with the intention of expanding coverage of the QL into the main magazine (previously, QL User had been a pull-out section within the magazine), and any future computers produced by Sinclair. However, the magazine quickly focussed almost entirely on the ZX Spectrum games scene. In 1990, the magazine was sold to Bath-based Future Publishing, and the April 1990 issue was the first to be published by the new company. That issue's news section contained a feature on the move, which jokingly suggested that Future had intended to buy a Sinclair C5 and had ended up buying the magazine by mistake. It folded in September 1993, after the commercial life of the Spectrum ended and the magazine had fewer than 40 pages per issue. A 94th issue, a retrospective on the magazine, was published in 2004 and given away free with Retro Gamer magazine. It featured interviews with notable writers and reviewers, a four page memoir written by former staff writer Phil South, and several new reviews and tips, keeping the style of the original magazine throughout. The magazine introduced a unique writing style, inspired by launch editor Roger Munford and expanded upon by subsequent editors and writers. Influences can be found in titles ranging from Private Eye to Viz. Towards the end of the magazine's life, and particularly under the editorship of Jonathan Nash, the style was further influenced by magazines YS had itself inspired, in particular Amiga Power and fanzine The Thing Monthly. The original 1986 team included Kevin Cox (editor), Teresa "T'zer" Maughan (deputy editor), Sara Biggs (production editor), Pete Shaw (editorial assistant), and Phil "Snouty" South (writer). Marcus Berkmann joined as staff writer in early 1987 when Maughan took over as editor. Freelance writers of the time included John Minson (writing under various pseudonyms, including Gwyn Hughes and Rachael Smith), Mike Gerrard, Max Phillips and David McCandless. The final 1993 team consisted of just two permanent staff members: Jonathan Nash (editor) and Andy Ounsted (art editor). Steve Anderson, Rich Pelley, Tim Kemp, Simon Cooke, Dave Golder and Simon Forrester were among those working on a freelance basis. YS's content varied widely, occasionally ignoring the subject of computers entirely. As the Spectrum scene diminished and there was less software to review, this happened more frequently. In 1992, under the editorship of Andy Hutchinson, several 'lifestyle' type sections were introduced. These included Haylp!, an agony aunt column, and The World (later retitled Flip! ), which contained reviews of films and books. Notably, this section included The Killer Kolumn From Outer Space, dedicated to science fiction news, rumours and reviews. It was written by Dave Golder, who went on to be the second editor of the successful SFX. Writing in the 100th issue of that publication, Golder cited his earlier work on YS and described SFX as "like hundreds of Killer Kolumns stapled together". Flip! was discontinued, but the Killer Kolumn was kept on until the penultimate issue in 1993. A similar page to Flip!/The World had existed in 1987-88 called Street Life, but this had also contained Spectrum game charts. The news section was originally called Frontlines and dealt with Sinclair news and rumours. It also regularly contained mock celebrity interviews (such as the "At The Bus Stop With..." series) and trivial charts, as well as features about the writers themselves. Subsections of Pssst and Frontlines included T'zers, a column which contained rumours about possible forthcoming releases for the Spectrum and, later on, the SAM Coupe. It was named after and originally written by Teresa Maughan, but the column remained after she left the magazine, as it was felt 'T'zers' was an appropriate title since it contained 'teasers' for future games. Rock Around The Clock, which first appeared in 1991, was a small column dedicated to looking at a particular back issue, as well as news and current affairs from the same time. Perhaps one of the odder sections of Pssst was the Peculiar Pets Corner. Editor Matt Bielby originally intended this to be a showcase for YS readers' exotic pets such as snakes, pigs, monkeys or spiders, but these "pets" also included such things as a purple fruit gum and a tuba. When an editor or member of the writing staff left, the magazine would often concoct fanciful stories surrounding their leaving. Matt Bielby was carted off to the funny farm after declaring himself to be God, Andy Ide became a Green Party ambassador, and Andy Hutchinson left to design a skate park at Alton Towers. In actuality, the majority of ex-YS staff went on to work for other magazines, such as Amiga Power. Your Sinclair's reviewing system varied throughout the magazine's life. During the Your Spectrum era, game reviews were confined to the Spectrum Soft section, later called Joystick Jury. Games were reviewed by a panel of reviewers and given a mark out of 10. After the name change to Joystick Jury, games were judged by each individual reviewer to be either a 'hit' or a 'miss' (in the manner of television show Juke Box Jury, after which it was named). The hit and miss system was abandoned with Issue 19, and with the transition to Your Sinclair, the review section was renamed Screen Shots. In Screen Shots, games were still rated out of ten, but they were also given separate ratings for graphics, playability, value for money and addictiveness. They were also now reviewed by individual writers, rather than a panel. In 1988, Joystick Jury was superseded by Joystick Jugglers, and the familiar cartoons of reviewers were introduced. Screen Shots was removed as a self-contained section in 1989, and reviews began to appear throughout the magazine, generally with the bigger games being reviewed towards the front. Budget games had their own section, Bargain Basement (later replaced with Replay when it was felt that original budget games should be reviewed alongside full price games). The magazine also began using a rating out of 100, rather than ten, when reviewing games. However, this was referred to as a 'degree scale' rather than a percentage scale, with a graphic of a thermometer representing the rating; the higher the rating, the "hotter" the game. Reviewer Jon Pillar embraced both extremes of the review scale, giving Count Duckula 2 a mere 9˚ and Mercenary 99˚. The final change in review style came in late 1992 when the various ratings for addictiveness, graphics, and so forth were replaced by a summary of the game's good and bad points, with an overall mark (now as a percentage) below that. Back cover of final issue. "Our work here is done." Games which were scored at more than 90˚/90%, or more than 9/10 before the degree scale was introduced, were awarded YS's coveted "Megagame" status, though this was undermined slightly when Duncan MacDonald gave his own deliberately bad Sinclair BASIC creation Advanced Lawnmower Simulator, the status in a moment of surreal humour. Reader games were also reviewed for a while in the "Crap Games Corner", many being inspired by Advanced Lawnmower Simulator or being just as deliberately bad. Good reader games sometimes ended up on the covertape. YS reviewers were often 'interviewed' in a column at first called Joystick Jury (the same as the reviews section in Your Spectrum), then Joystick Jugglers, and finally (when there were fewer games to review and they wanted to introduce the team as a whole, including design staff) The Shed Crew, a reference to the recurring joke that after the move to Future Publishing, their office was now a garden shed. The Jugglers were depicted with caricatures mostly drawn by Nick Davies, although some writers (such as Jon Pillar/Jonathan Nash) drew their own and art editor Andy Ounsted drew most of the latter reviewers. The Juggler caricatures took on something of a life of their own, and in 1990, a game, YS Capers, was given away with the magazine in which you had to shoot the YS crew, depicted in their cartoon forms. Originally, the tips section of the magazine was called Hack Free Zone, to distinguish it from Hacking Away, which was dedicated to type-in POKEs. Both sections were written by Phil South under the pseudonym of Hex Loader. The sections were merged in 1987 to become the Tipshop. It contained all tips, cheats and complete solutions sent in by readers, and spawned its own book, the YS Tipshop Tiptionary. Dr. Berkmann's Clinic (renamed The YS Clinic With Dr. Hugo Z Hackenbush after Marcus Berkmann left to go freelance), originally set up to provide help for the game Head Over Heels, allowed readers to provide solutions to each other's gaming problems, more often than not solved by Richard Swann. Practical Pokes, hosted mainly by Jon North, was the successor to Hacking Away, and contained both type-in and Multiface POKEs. The Tipshop was hosted variously by Phil South, David McCandless, Jonathan Davies and Linda Barker. While YS is often thought of as primarily a games magazine, throughout its life it hosted a variety of technical columns, mainly dedicated to programming technique. Program Pitstop, first hosted by David McCandless, then Jonathan Davies and finally Craig Broadbent, contained type-in programs and was the one of the last columns of its kind, a remnant of an era when computer magazines would dedicate entire sections to BASIC program listings. Most of the programs were in Sinclair BASIC, although some were in hexadecimal machine code, for which a special interpreter, the Hex Loader, was written. It replaced the pull-out section Program Power; the main difference was that Program Pitstop mainly included listings for utility programs and demos, while Program Power also included games. Spec Tec (Adam Waring) and its descendant Spec Tec Jr (Simon Cooke) were home to readers' technical queries. The introduction to these columns were typically written in the style of a Philip Marlowe monologue, occasionally including ongoing plots. 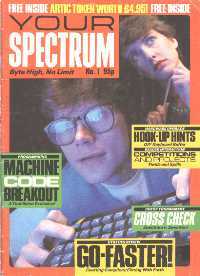 Other technical columns included Rage Hard, an occasional page which brought news of peripherals and other enhancements for the Spectrum; Steve's Programming Laundrette, in which Steve Anderson took the reader step-by-step through producing a BASIC game; and Simon Hindle's Dial Hard, which helped you connect a Spectrum to the Internet. Before the magazine's relaunch as Your Sinclair in 1986, Your Spectrum contained a plethora of technical articles, including guides on programming in machine code and Forth, and information on how to upgrade the basic Spectrum set-up to incorporate better sound and more memory. Small Print - either deliberately short letters, or parts of longer letters taken out of context, most often for comedy value. Doodlebugs - readers' cartoons, often based around puns on current Spectrum games (e.g. a cartoon based on the game Midnight Resistance showed a house with the bedroom light on and a speech bubble saying "Not tonight dear, I've got a headache"). Doodlebugs spawned one of YS's occasional comic strips, Ernie The Psychotic Madman, drawn by Phil McCardle. Kindly Leave The Stage - readers' jokes, often nonsensical or surreal (an example being Q: Why is an orange orange? A: Because you can't clean a window with a spade), and often met with a gong. Wonderful World of Speccy - letters from readers for whom English was not their first language, many from Eastern Europe, where the Spectrum scene was flourishing well into the early 1990s. Trainspotters - where readers would send in mistakes they'd noticed in a previous issue of the magazine, in the hopes of convincing the editor to send them a Trainspotter Award. Most of the time, however, the editor found a way out of sending the award, by coming up with convoluted reasons why the 'mistake' wasn't a mistake at all (for example, by insisting there was no such place as the Isle of Man after accidentally omitting it from a map in Issue 50). The Trainspotter caricature was supposedly based on the man pictured on the cover of Issue 1 of Your Spectrum. As with the Jugglers, this was drawn by Nick Davies. The last ever award was given to Stuart Campbell, a then former writer who had since left, who found a mistake in a reprint of an article that he wrote. The Picos - a fictional family created for a series of columns in the letters page. Firstly there was Madame Pico, a psychic and agony aunt who answered readers' problems with "ooh, you poor dear". After her kidnapping, her son Bud Pico, a DIY specialist, took over. His solutions to readers' DIY problems often involved Rice Krispies. After Bud's "death", the baton was passed to cousin Femto Pico, a scientist and nightclub bouncer, and finally, Femto's sister Soya Pico, a vegetarian hippy. Most of the letters to the Picos were fictional. Norman Tebbit's Dead Serious Corner (originally Peter Snow's Dead Serious Corner) - one of the last additions to the letters pages, containing, as the name suggests, more serious letters than the rest of the pages. These often dealt with consumer issues, such as the price of games, or declining software support for the Spectrum. The Star Letter was awarded three full-price Spectrum games. When asked what qualities a star letter possessed, editor Linda Barker answered "A star letter is one that makes the entire Shed crew rock with mirth, or touches their hearts," although other editors had their own criteria for the type of letter they awarded Star Letter status to. Like many later computer magazines (such as Zero and Amiga Power) Your Sinclair created a sense of community with its readers through the letters page, and many readers wrote in regularly, becoming almost part of the team themselves. Indeed, several letter writers went on to write for YS in a freelance capacity, including Leigh Loveday and Rich Pelley. Along with Jonathan Davies, Pelley had formerly written for the fanzine Spectacular, and both became regular contributors for the magazine between 1988 and 1993. After YS closed, Davies went on to become editor of Sega Zone, Amiga Power and PC Gamer, while Pelley regularly wrote articles for a number of magazines. As reduced advertising and lack of material to review caused YS's page numbers to drop, YS introduced YS2, which was incorporated on the cover tape, and contained a teletext-like viewer program and a collection of some fifty or so 'extra' pages of content largely written by then editor Jonathan Nash and regular contributor Steve Anderson. It contained, amongst other things, short stories, surrealist and absurdist humour, and Private Eye-style fake news. Not long before the magazine folded, plans were being made to improve the interface and increase the number of pages. The code for YS2 had been taken (supposedly without permission) from adventure game company Delta 4's similar Sceptical program. The writers often jokingly referred to a possible lawsuit against them, and wrote as an acknowledgement "The Sceptical driver is copyright Delta 4, who are really nice and hardly ever sue". No lawsuit materialised - YS and Delta 4 had a good working relationship, the magazine having featured several of their games on the covertape in the past. In 1999, a webzine, YS3, was launched by comp.sys.sinclair newsgroup regulars Nathan Cross and Jon Hyde, and managed to recreate something of the original magazine's style and humour. It ran irregularly until 2002 before going on an extended hiatus. It has since returned in blog form. Today it is unusual to find former YS writers as regular staff members in the mainstream press; however, many of them continue to work in the industry as freelancers. Marcus Berkmann writes for Private Eye, The Oldie and The Spectator and has published several books. Phil South was a freelance writer for Amiga Format and Computer Shopper, then was a freelance contractor for Disney Channel in the UK. He is currently working at the Bristol Old Vic Theatre School. Dave Golder was the editor of SFX from 1996 until 2005, then after a short break returned to work alongside the current team with the title Special Projects Editor. Stuart Campbell continued to work for Amiga Power and other magazines before going to work for Sensible Software as a designer. He subsequently created the World of Stuart site, a cross between a blog and a portfolio of his work for potential employers. Matt Bielby launched and edited a number of magazines for Future and other publishers, including SFX, Total Film, .net and Nuts. Teresa 'T'zer' Maughan has written a number of pop books and worked on Star Pets magazine. Pete Shaw (aka Troubleshootin' Pete) is now a freelance computer programmer and theatre producer. Jonathan Davies, a staff writer and regular contributor, went on to edit Amiga Power and PC Gamer. He now runs the Games Press website, a PR resource for the games industry. Jonathan Nash, YS's last editor, also went on to work for Amiga Power and PC Gamer, and was also responsible for the short-lived satirical webzine The Weekly. Simon Cooke went on to write for .net, Internet Today, Internet & Comms Today, Net User, How To Get Online and Arcane. He currently works for X-Ray Kid Studios as Director of Engineering, and was Principle Technology Engineer and Lead Gameplay Engineer on This is Vegas for Surreal Software; he also worked on The Suffering: Ties That Bind. Nat Pryce now consults in software design and development and was a winner of the 2006 Gordon Pask Award for contributions to Agile practice. Leigh Loveday, a regular letter writer and reviewer in the latter days of the magazine, now works for Rare. David McCandless since became a freelance writer for Wired, The Guardian, Tank, and The Independent, and writes and designs the blog Information is Beautiful. Tony Lee, Joystick Juggler in the late eighties is now a successful comics and graphic novel writer, most recently known as the writer of the ongoing Doctor Who comic for IDW. There are currently few magazines that share YS's (and Amiga Power's) self-referential style, although the aforementioned SFX magazine and PC Gamer share some stylistic traits. Some "YS Speak" has also filtered through to Heat magazine, and nonsense captions, introduced by James Leach, are almost ubiquitous, used by FHM magazine and Total Film among others. ^ a b "Matt Bielby". Your Sinclair: A Celebration. http://www.yoursinclair.co.uk/matt.shtml. Retrieved 2006-08-31. ^ a b Nick Humphries. "September 1993, Issue 93". ysrnry.co.uk. The Your Sinclair Rock 'n' Roll Years. http://www.ysrnry.co.uk/ys93.htm. Retrieved 2006-08-31. ^ Rich Pelley. "The YS Guide to YS Speak, originally written for the September 1993 issue". ysrnry.co.uk. The Your Sinclair Rock 'n' Roll Years. http://www.ysrnry.co.uk/articles/ysspeak.htm. Retrieved 2006-08-30. ^ Sfx. January 2003. pp. 32. ^ "Duncan MacDonald". Your Sinclair: A Celebration. http://www.yoursinclair.co.uk/duncan.shtml. Retrieved 2006-08-31. ^ "Your Spectrum Issue 1" (JPEG). http://www.users.globalnet.co.uk/~jg27paw4/yr01/yr01_cvr.jpg. Retrieved 2006-08-31. ^ Barker, Linda (January 1993). "Letters". Your Sinclair (85): 20. ^ "YS3 Issue 1". http://www.ysrnry.co.uk/ys3/issue1/index.html. Retrieved 2006-08-31. ^ "YS Issue 14". http://www.ysrnry.co.uk/ys3/issue14/index.html. Retrieved 2006-08-31. ^ "YS3 latest issue". http://www.ys3.org/. Retrieved 2007-05-29. ^ "Marcus Berkmann". Your Sinclair: A Celebration. http://www.yoursinclair.co.uk/drb.shtml. Retrieved 2006-08-31. ^ "Phil South". Your Sinclair: A Celebration. http://www.yoursinclair.co.uk/snouty.shtml. Retrieved 2007-07-18. ^ "T'zer". Your Sinclair: A Celebration. http://www.yoursinclair.co.uk/tzer.shtml. Retrieved 2006-08-31. ^ "Johnathan Davies (and Farty the Warthog)". Your Sinclair: A Celebration. http://www.yoursinclair.co.uk/farty.shtml. Retrieved 2006-08-31. ^ "Gordon Pask 2007 award winners announced". Agile Alliance. http://www.agilealliance.com/agileevents/GordonPask2007-winners. Retrieved 2006-09-03. ^ "Leigh Loveday's Own Special Page... (direct from Port Talbot)". Your Sinclair: A Celebration. http://www.yoursinclair.co.uk/loveday.shtml. Retrieved 2006-08-31. The YS Rock 'N' Roll Years — Unofficial site, dedicated to archiving games reviews and feature articles from the magazine. YRUA? The Your Spectrum Unofficial Archive — Archive of articles from Your Sinclair's forerunner, Your Spectrum. Your Sinclair: A Celebration — Fan-written website detailing both YS and YS-related material. YS2/100 — An article written in dictionary form describing aspects of the magazine, written by former editor Jonathan Nash. Full page scans of the magazine at World Of Spectrum. Good Old Games — Scans of Your Sinclair Magazine and other.